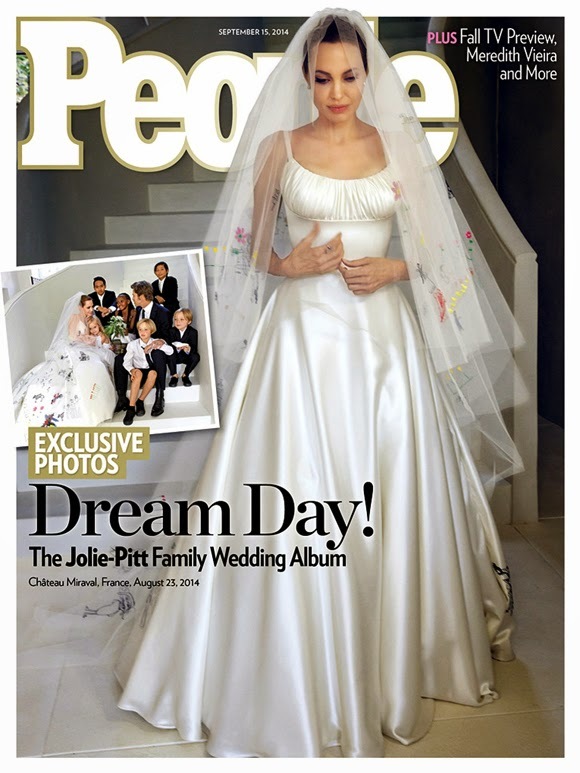 Home hollywood #Entertainment: Check Out Angelina Jolie’s Wedding Dress + First Kiss From Secret Wedding To Brad Pitt! #Entertainment: Check Out Angelina Jolie’s Wedding Dress + First Kiss From Secret Wedding To Brad Pitt! People Magazine & Hello! Magazine International got the exclusive rights to Angelina Jolie & Brad Pitt‘s wedding pictures! The celebrity magazine has just unveiled the first pictures from the top secret wedding between the two A listers which went down on August 23rd 2014 at the Château Miraval, the family’s estate in the French village of Correns. see another pic after the cut. Now let’s talk about Angelina’s dress! It was custom Atelier Versace creation designed by Donatella Versace. Luigi Massi, the master tailor at Atelier Versace, sewed dozens of designs from her children’s drawings into the dress and veil. The one of a kind custom-made Atelier Versace white silk-satin gown gathered at the bust with an elongated train. She accessorised her gown wearing a pair of white Versace silk satin pumps. The groom 50 year old Brad Pitt, rocked a suit from his closet – he borrowed a tie from one of his sons because he forgot to pack his! Brad & Angelina also reveal their six children planned the wedding. Eldest sons Maddox, 13, and Pax, 10, walked their mom down the aisle; Pax also baked the wedding cake, Zahara, 9, and Vivienne 6, were flower girls and tossed petals gathered from the garden; while Shiloh, 8, and Knox, 6, served as ring bearers. They also helped write the wedding vows. WHAT DO YOU THINK OF ANGELINA’S DRESS?